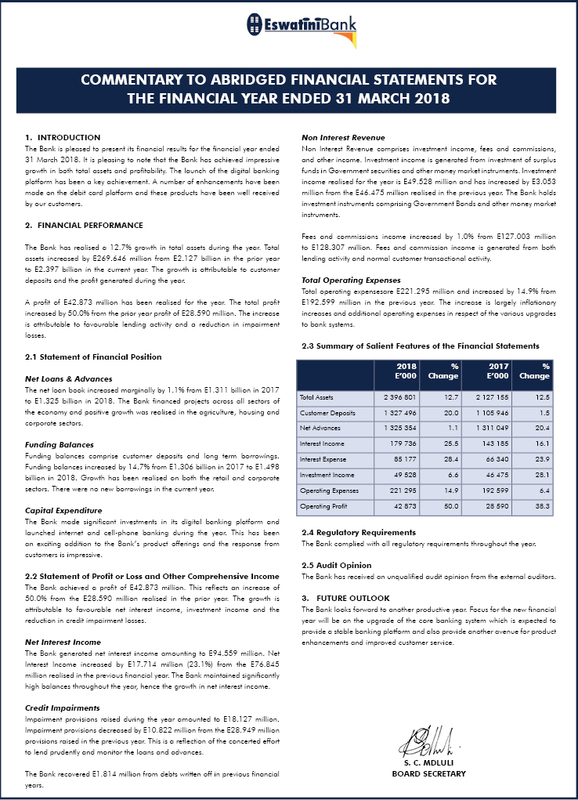 We have audited the financial statements of Swaziland Development and Savings Bank, which comprise the statement of financial position at 31 March 2018, and the statements of comprehensive income, changes in equity and cash flows for the year then ended, and the notes to the financial statements which include a summary of significant accounting policies and other explanatory notes, and the directors' report. The directors are responsible for the preparation and fair presentation of these financial statements in accordance with International Financial Reporting Standards, and in the manner required by the Swaziland Development and Savings Bank Order 1973, as amended and the Financial Institutions Act, 2005 and for such internal control as the directors determine is necessary to enable the preparation of financial statements that are free from material misstatement, whether due to fraud or error. 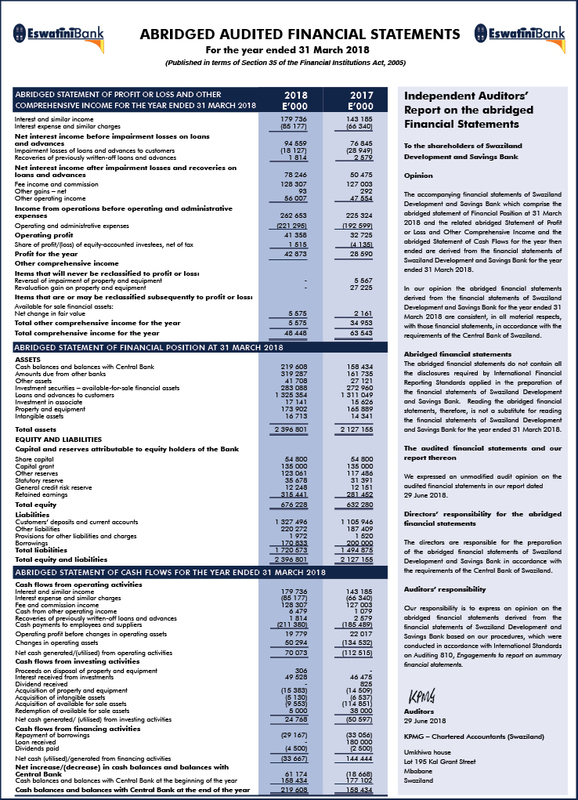 In our opinion, these financial statements present fairly, in all material respects, the financial position of Swaziland Development and Savings Bank at 31 March 2018, and its financial performance and cash flows for the year then ended in accordance with International Financial Reporting Standards, and in the manner required by the Swaziland Development and Savings Bank Order 1973, as amended and the Financial Institutions Act, 2005. The Bank has a mandate to raise deposits and provide finance to various sectors for economic growth. The Bank holds sturdy funding balances and has, as a result, ensured prudent utilization of resources whilst maintaining a stable liquidity position. Despite the net decrease in loans and advances, the Bank financed projects in the Corporate, Agricultural, SME and Retail sectors which contributed to economic growth and creation of employment. The total assets decreased from E1.909 billion to E1.890 billion in the current year. The Bank's statement of financial position remains strong with a balanced mix of loans, Government securities and short term funds. A profit of E20.670 million has been realised for the year. The total profit decreased by 25.3% from the prior year profit of E27.689 million, due to a reduction in gross revenue in line with the reduction in the net loan book. The Bank financed a number of significant projects and continued to finance the SME, Agriculture and personal sectors in the year under review. Significant growth has been achieved in the business finance and retail overdrafts portfolios. Exposure in the personal market has reduced significantly as customers are credit conscious and service current debts. The Bank has also managed this sector in line with risk appetite. As a result, the net loan book has decreased by a net E91.925 million from E1.181 billion in the prior year to E1.089 billion in the current year. Customer deposits increased by 3.4% from E1.053 billion in the prior year to E1.089 billion in the current year. The increase contributed to the strong liquidity position, notwithstanding the significant escalations in the cost of funds. Total Assets decreased by 1.0% from E1.909 billion in 2015 to E1.890 billion in 2016. The decrease is largely due to a net outflow in resources to repay long term borrowings. The repayments to long term providers of finance have been partly offset by the increase in customer deposits and the increase in shareholders' funds, as a result of profits generated in the current year. The Bank achieved a profit of E20.670 million. This reflects a reduction of 25.3% from the prior year profit of E27.689 million. This is attributable to the decrease in the net loan book which has impacted on interest income. Prior year profits included significant revenues from the investment in the Associate due to a once-off transaction, hence the decrease in the current year. The Bank realised a Net Interest Income of E69.800 million, which decreased by 16.6%. The decrease is in line with the reduction in the lending book. Impairment provisions decreased by E28.179 million from E42.608 million in 2015 to E14.429 million in 2016. Prior year balances included impairments relating to historic bad debts. The Bank continues to improve it's lending and collection processes to ensure a robust loan book. From previously written off debts, the Bank has managed to collect E3.553 million. 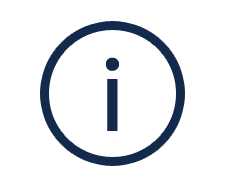 Non Interest Revenue comprises investment income, fees and commissions and rental income. Investment income is generated from investments of surplus funds in Government Instruments (Bonds and Treasury Bills), Fixed and Call Deposits and it increased by 40.5% in line with the increase in surplus funds balances. The Bank participated in the acquisition of Government paper and holds a stock of Government and Corporate Bonds amounting to E193.957 million. Operating costs increased from E163.429 million in 2015 to E181.032 million in 2016. The increase is due to annual cost of living adjustments and inflationary increases on other operating costs. The Bank complied with all regulatory requirements throughout the year. The Bank has received an unqualified audit opinion from it's external auditors. The year 2016/17 brings about a number of changes in the regulatory environment. Whilst these changes are stringent, the Bank shall continue to explore innovative ways of doing business so as to continuously improve business performance and enhance both economic growth and shareholder value. With Swazi Bank SMME Loan don't let money come in the way of your personal aspirations.